An important problem in brain research deals with understanding how visual stimuli are processed by the brain to create our every-day visual experience. It is still unknown how multiple neurons work together in the visual system to accomplish the encoding of visual information that is sampled from the environment dynamically and effortlessly by our eyes. Our researchers have found a way to group the recorded activity of multiple neurons and to measure how quickly they react together to the ever-changing visual world. They have found that the internal timescale of the brain, i.e., the time window needed by neurons to encode a given aspect of the visual stimulus, is tightly correlated to the external timescale of the visual stimulus, i.e., the speed with which the visual image on the retina changes. This means that the brain is well adapted to the environment and the visual system may have been important for survival. For example, when quick responses are needed as a reaction to the attack of a predator, the rapid change in the field of vision can determine the brain to quickly respond with multiple neurons that convey information rapidly, on timescales of a few milliseconds. When the visual image evolves slowly, neurons can afford to be “lazy” and they encode the visual stimulus with slower activity patterns. 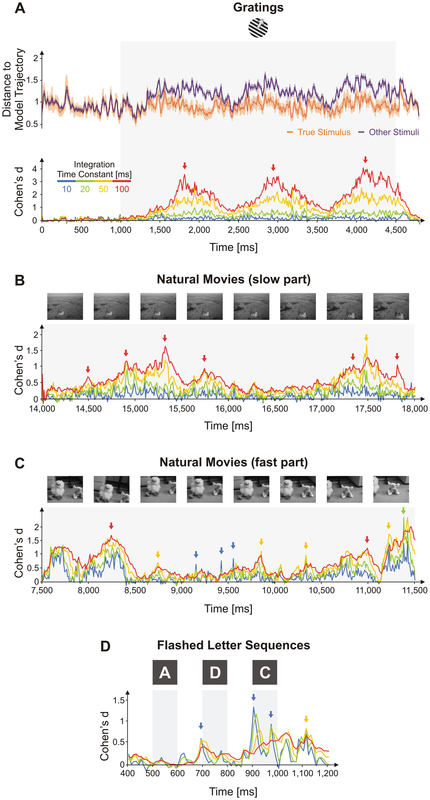 These findings were published in PLoS ONE (Jurjuţ O.F., Nikolic D., Singer W., Yu S., Havenith M.N., Mureşan R.C., Timescales of Multineuronal Activity Patterns Reflect Temporal Structure of Visual Stimuli. PLoS ONE 6(2): e16758, 2011), a journal of the Public Library of Science from USA.